Archangel Jophiel has a consort, the archeia Christine who works with him on God's second ray - the yellow ray of illumination. 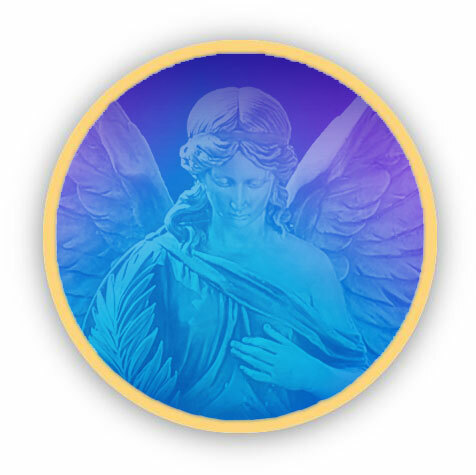 The name Jophiel means 'Beauty of God'. Illumination encompasses wisdom, understanding, inspiration, knowledge and clear seeing. Where do our inspiration and wisdom come from? All good things come from the mind of God, the source of all creativity. How Do we access this mind? Our Higher Self is connected to the mind of God and Jophiel can help us get in touch with this part of ourselves. His angels can free us from anything that blocks our oneness with with our Higher Self; conditions such as self-doubt, fear, lack of self esteem and addictions of any kind including chocolate or nicotine. Ah, but he won't do it unless we ask him. God gave us all free will and no angel or archangel will abuse that. They all wait patiently for our prayers and calls so they can go into action. My daughter Claire had never felt she was very academic and had difficulty staying calm under pressure. So when her end of course exam loomed she felt panicky. I reminded her to call to Archangel Jophiel and his angels to help her. During the exam she felt quite calm. He did not do the work for her, but enabled her to recall and write down the information that she had learned. She didn't get an A, but she did pass. Did an angel get you out of a tight spot one day? Tell your story and read other people's too! Jophiel and Christine are also concerned with the dissolution of ignorance, pride and narrow mindedness. So if you need to have a meeting with someone who has these attributes you can call to him to help dissolve these blocks to a successful meeting. On a world scale, we can ask him to expose wrongdoing in governments and corporations and help in fighting pollution and cleaning up our planet. But what he is most concerned about is the imbalance in the education systems in the West, resulting in profound levels of ignorance. We see the schools strive to accelerate the computer of the mental body of the children. This is just one aspect of education. To dispel ignorance and become balanced and whole we need to nurture direct communication with God through the heart also. The yellow flame of illumination is focused at Archangel Jophiel's retreat in the etheric realm over the plains of Central China, south of the Great Wall near Lanchow. The wisdom of Confucius is well known - he lived in ancient China, an advanced civilization that flourished while the West was still in the dark ages. Read more about these magnificent archangels here.